Some players seem to “just have it” when it comes to chipping and pitching around the green. Although we would tend to think that these people practice and master every possible green-side shot but really there is one common denominator that connects them all: Good Contact. A Golf Digest article enlightens us on the number one skill needed for great shots around the green and that’s to make good contact with the ball. Most players get caught up in the finer details of the shot; the carry, the roll and the loft are top of mind when the club-head’s contact with the ball should be number 1. 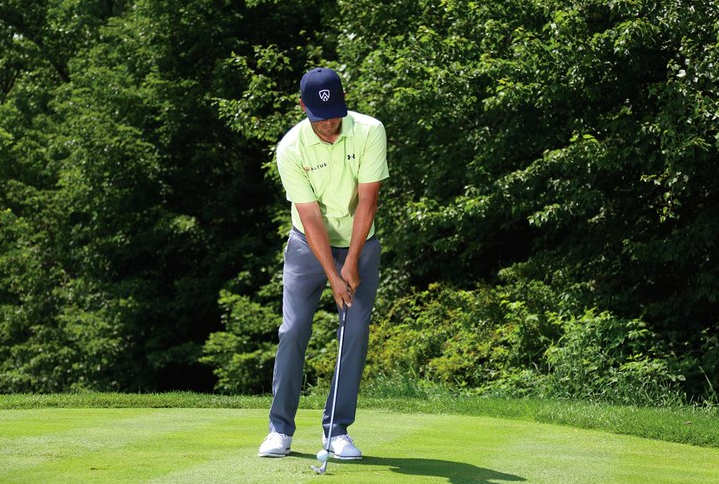 1: Take a narrow stance, with the ball in the middle and your spine vertical—not tilted away from the hole. 2: Set more weight on your front foot, and then lean the handle just ahead of your pants zipper. 3: Open the club-face a touch. These positions will pre-set a swing where you catch the ball first, then brush the grass. The swing flows naturally from the setup. It’s an arc back and through with a slight descent into the ball. With the face open, the club will slide through impact. Remember, it’s about ball-first contact.